The humble sambar (Spinach/Bayam Sambar). The must for most Indians. Like the main calling for a vegetarian meal (Sodhi/Coconut Milk Stew & Instant Rasam) most of the time? For me personally, sambar has taken a toll on me. Why? Oh-god. The years of literally eating sambar cooked by mummy dearest until I really can't stand sambar anymore. Of course, without a doubt, this Indian man I am married to? Sambar is still his best friend and me faithfully making (Dalca/Dhal Mutton Curry). Sambar for rice, sambar for tosai, sambar for idli, sambar for roti canai and sambar and sambar. 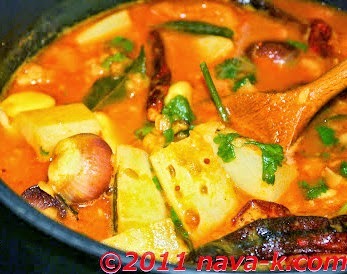 I don't think there will be the end to sambar in my house or who knows, the future may hold a different food picture. For the time being however, this is sambar. Lentil/dal cooked alongside spices, radish, tomato, seasoned by tamarind juice and scented with coriander leaves and curry leaves. 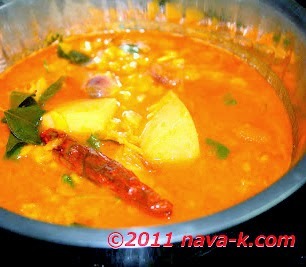 Simmer dhal with enough water to soften. Heat oil in a separate wok. When heated, add radish, shallots, tomato and garlic. Fry and stir for about 5 mins. Add dried chillies, curry leaves, mustard and cumin seeds. Fry for another 1 min. Tip into in simmered dhal. Pour water (suggested 1 liter) and tamarind juice. Add chilli powder and turmeric powder. Stir and simmer until radish becomes soft. Love the vibrant color......dal looks tasty and tempting too! !